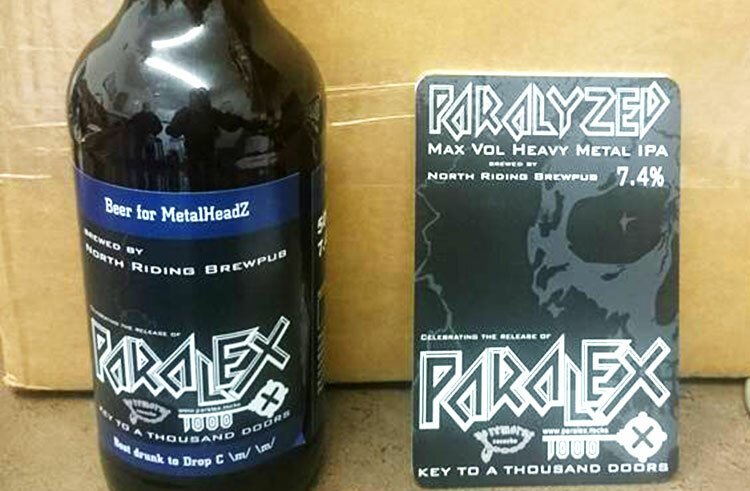 Our specially commissioned beer ‘Paralyzed’ 7.4% Max Vol Heavy Metal IPA is ready. Yeah! Lovingly crafted by John and Stu at the fantastic North Riding Brewpub, it is extremely limited in supply and will be exclusively available for a short time only at our upcoming promotional nights, taking place soon. Stay posted for an announcement very shortly. The first bottle will be cracked and drunk live on air during our Radio Newark Rock Show ‘Takeover’ appearance on Tuesday March 8th, starting at 21.00 GMT. Listen online at Radio Newark to hear a selection of tracks from the soon to be released album ‘Key to a Thousand Doors’ as well as tracks selected by the band that have influenced Paralex style over the years. You can also phone/text/email/message us with your questions. We hope you can tune in.